Design and prototype a mobile application that addresses the above insight. It should seamlessly integrate into and overall improve a students' everyday life. The currency of the app is "favors." Users need to do a favor to get a favor in return. The one-for-one exchange is relevant in today's sharing culture (as evidenced with the rise of Uber and AirBnB for example). 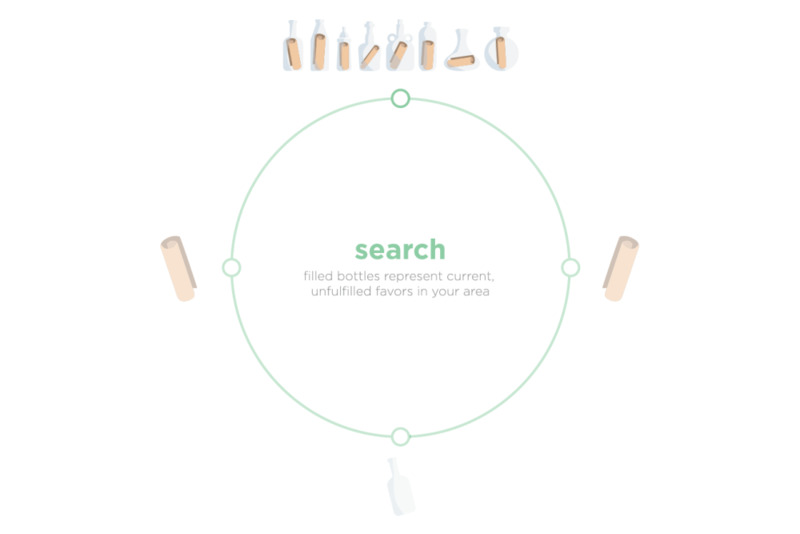 The familiar metaphor of a message in a bottle is used to visually symbolize the interaction. Fun fact: "Vu" means "you" in French. The app's name literally means "for you", which is the main focus of the interaction. We developed two different user personas to best understand the crucial interaction between two users in the app. We also mapped out their journeys through the app. In order to create brand cohesiveness across the entire app, we developed a detailed style guide complete with margins, colors and typography. We also did a lot of research on different mobile app trends and used our findings to inform our decisions. First time users are greeted by hints that explain the purpose of each screen. This is to help explain the metaphor better. After the first use of Forvu, these screens no longer appear. Forvu dynamically reacts to weather. During user testing, we found that weather is a major factor for users when deciding on which favors to accept. Swipe across the home screen to search for favors in your area. Once you respond to a message, you can chat with the other user on the messages screen. The number underneath each scroll indicates how long until the favor begins. Easily ask for favors/send messages from the sea screen. Once someone responds to the message, you can choose to accept or deny their offer. If you accept it, the full chat opens. When the favor ends, you can acknowledge if you were helped. The more favors you do, the more gem points your receive. The advantage of having a higher gem status is that other users are more likely to trust you to help them. Every level up also entitles you to a free bottle to ask for an extra favor. We then explored how the mobile app would translate as a service available across devices. On the tablet device, the user interface remained mostly the same across all screens. The Bottles and Messages pages converted from a three-column grid to a four-column one. The desktop version of the service went through some drastic changes. Because of the new relationship between viewer and screen, many of the features were featured all at once. The user profile, messages, gems and conversations were placed on one side of the app. 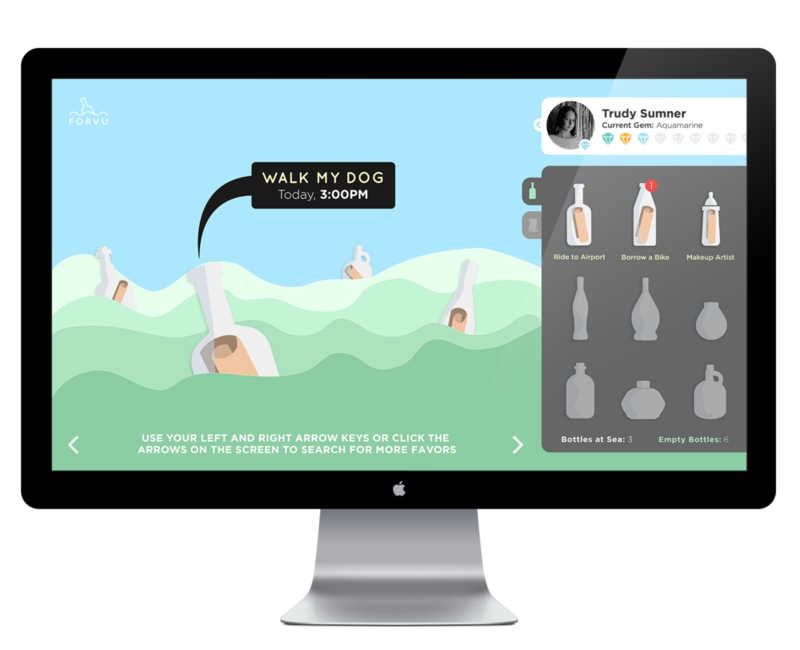 Users can scroll through the sea and search through favors all at once.